Check in with us at the Ocean Sports Beach Hut at Anaeho’omalu Bay to create your perfect day at the beach! 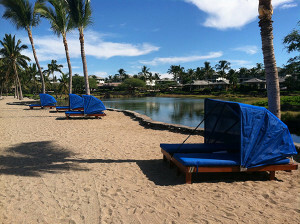 Grab a chaise lounge under the swaying palms (complimentary) or you can choose to rent a shaded cabana for the day. We recommend you start your day snorkeling the protected waters of the bay – we rent high quality snorkel gear by the hour, half-day, day, and even week, and we can provide life jackets, noodles or banana belts to help keep you afloat (we rent boogie boards too). 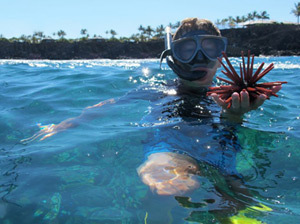 Be sure to ask us for a personalized Guided Snorkel Excursion led by our experienced crew for a great way to learn about the reef and a great chance to see the humuhumunukunukuapua’a. The whole family will love our stable sit-on-top Kayaks (singles, doubles, and triples available), and Hydro-bikes. We also offer the “newest” ancient Hawaiian activity… Stand-Up Paddleboards! Lessons and Guided SUP and Kayak Excursions of the bay can be arranged with us too. Sound fun? Need more information? Click HERE to see our Beach Toy and Excursion Rates, or call us at (808) 886-6666 ext. 3.